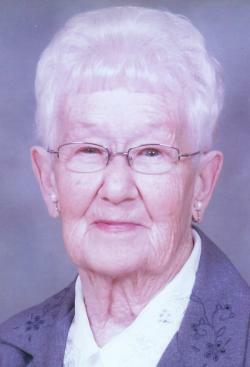 It is with great sadness we announce the passing of Norma "Audrey" Fillmore, 95 years of age, of Centennial Villa. Audrey passed away peacefully on Thursday, Apr 4, 2019. Born in Springhill, she was a daughter of the late George "Brownie" & Mary Pearl "Mayme" (O'Rourke) Burden. Audrey married Caleb Rushton and had one daughter. She then married James Fraser and had her other five children. In later years after Jimmy's death, she married Glen Fillmore who had two sons. Audrey was a faithful member of the Springhill Baptist Church; actively involved in the church's Ladies group for many years; took part in the church prayer group in Rodney. She enjoyed being a member of the Springhill Seniors club. Audrey was always willing and enjoyed assisting in the groups she was involved in from helping in the kitchen, making sandwiches, organizing bazaars for years and even participating in skits. Audrey proudly displayed the certificates of appreciation she received from them and the town for her work. She became ill when she reached 80 so she had to slow her pace and missed being a part of these groups. She worked many years as a clerk, first in Wilson's Ladies Wear and then at Stedman's. She could be rushing up the hill to get home to prepare lunch for the kids before they got home from school and then rushing back to work. She was a great manager of her time. In earlier years, while raising a family and working outside the home, Audrey belonged to a card club and her love of 45's continued. She would also meet with friends for an evening of knitting and crafts. As a young person she enjoyed skating and talked about those years when skating on her mother's single blade skates. Audrey was a very hard worker and never stopped doing and learning new things. This was over and above the usual duties of a home and family. She sewed, made preserves, did Toni's for friends, scooped blue berries (as well as any man), hayed, milked cows, made butter, knit, did ceramics and any other job when needed. Although not from a family of musicians, she loved singing and dancing. She would take to the floor whenever she had a chance even at 95. Enough can't be said about the love she had for each of her children, although seldom spoken we knew how much we meant to her. She knew each of us well and accepted us as we were. Her friendly nature and love of people were always evident when any number of people could drop in and were welcomed to stay for a meal or an evening lunch, even though times were hard. Her faith gave her the saying "Things have a way of working out" and she lived by that, taking one day at a time. Audrey will be sadly missed by her children; Arlene Hood (Norman) Mt. Denson, NS, Donald Fraser (Anna Kierstead) Springhill, NS, Dorothy Hollis (Dave Smith), Springhill, NS, Gerald "Jerry" Fraser (Joanne) of Beaumont, NL, Harold Fraser (Patty Weatherbee) of Springhill, Ann Casey (Dan) Kolbec; sister in law Helen Burden. She is also survived by Glen Fillmore and sons, Randy (Lisa) and Dennis (Merrilee). Thirteen grandchildren, eighteen great grandchildren, one great great grandchild. Besides her parents, she was predeceased by her brother, Dr. Arnold Burden. Arrangements are under the care and direction of A.H. Brown Funeral Service, 5 McFarlane St., Springhill, NS (902-597-2361). The family will receive visitors on Sunday, April 7, 2019 from 2-4 p.m. A funeral service will be held at the funeral home on Monday, April 8, 2019 at 2 p.m. Burial to take place in the Hillside Cemetery, Springhill, later in the spring. Donations may be made to the Springhill Baptist Church, Centennial Villa or to the charity of your choice. Sharing of memories and condolences may be sent to the family by visiting Audrey's online memorial at www.brownsfuneralhome.com or through the A H Brown Funeral Home Facebook Page. Springhill Baptist Church, Centennial Villa or to the charity of your choice.